A 52 year old male with a h/o kidney transplant presents to the emergency department with pain over his transplanted kidney site (right pelvic region). He also notes increased weakness, nausea and a significant decrease in urine output. He denies any fever. He states he is compliant with his anti-rejection medications. A bedside ultrasound is performed, what is the next best step in management? Urinary obstruction in a transplanted kidney can be missed initially as pain over the patient's graft site and decreased urine output is easily contributed to possible rejection or infection. 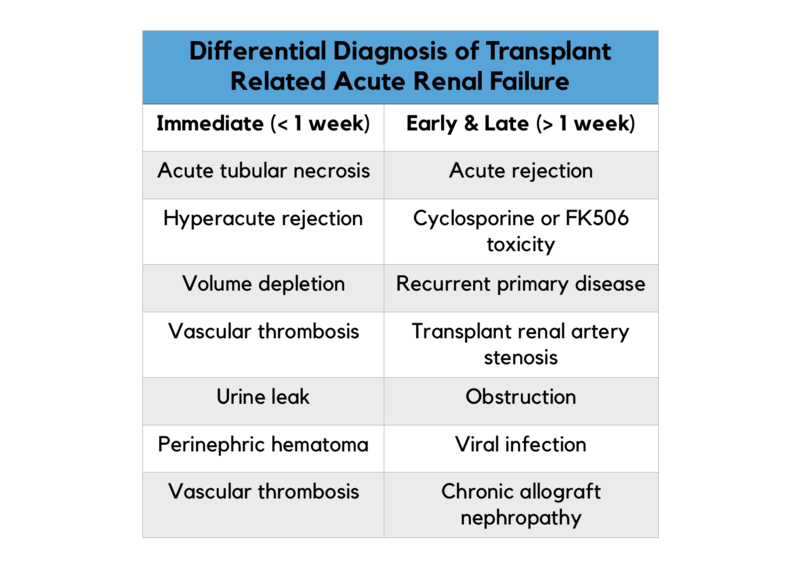 The differential diagnosis of acute renal failure in the transplanted kidney is broad (see table below) and emergency department management should include a thorough evaluation for prerenal, intrinsic and post renal causes, in consultation with a transplant service. All renal transplant patients presenting with acute renal failure should have a formal renal ultrasound with doppler to evaluate the graft however often this is not available immediately and a bedside ultrasound can assist with rapid identification of acute urinary obstruction.